First broadcast out the 78-02-05 on 6225 kHz. This station had the same address as old Radio Omega, so the theory is that those two stations were the same one. 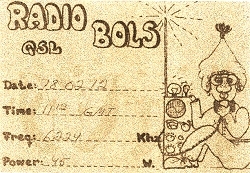 Bols has also been reported elsewhere as Radio Gold. The programs was also reported to be rather poor. Both in quality and modulation!